A reason to not be excited for the Continental – United merger. Recently pricing nonstop flights to Chicago – I found this somewhat surprising. 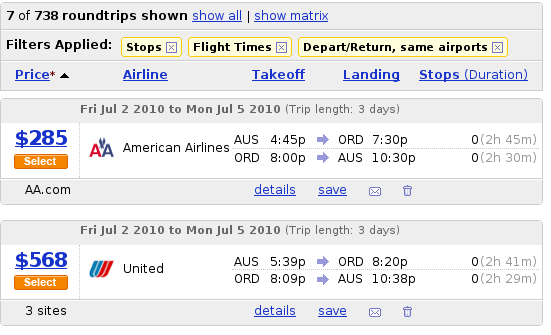 What makes United think they can charge 2x the price for nearly exactly the same flight between Austin and Chicago? I’ve seen this pretty frequently from United lately. I’m not excited to see what they’re going to be doing to Continental’s prices or quality of service. I guess I can pretty much give up hopes of ever being able to fly nonstop to Cleveland again – despite Continental’s hub there.